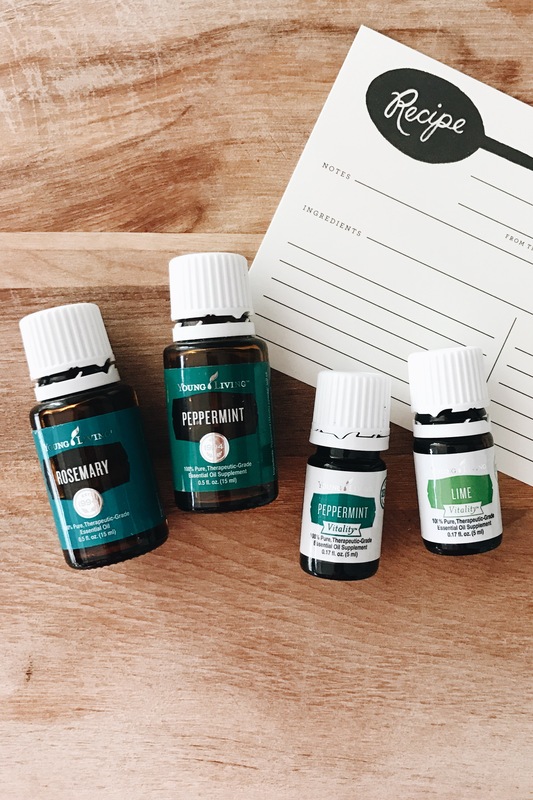 Our family LOVES essential oils, and so many of you have sent me questions on how they work or how you can work them into your routine. We started using them as a way to help support our immune systems & encourage better sleep habits for our family, and to say that they have done so much more than that, is really an understatement. So I wanted to share how we use our oils every single day and why we love them!! 1. For a better night’s sleep. There is a reason that every baby product on the planet contains lavender. We first started using oils for sleep (we had already used them for everything else, but for some reason I hadn’t thought of them for this yet) when Claire was about six months old and waking EVERY. HOUR. We added Lavender & Cedarwood to her diffuser and it completely changed her sleep habits. For the first time ever, she slept a full six hours, and it only got better after that. 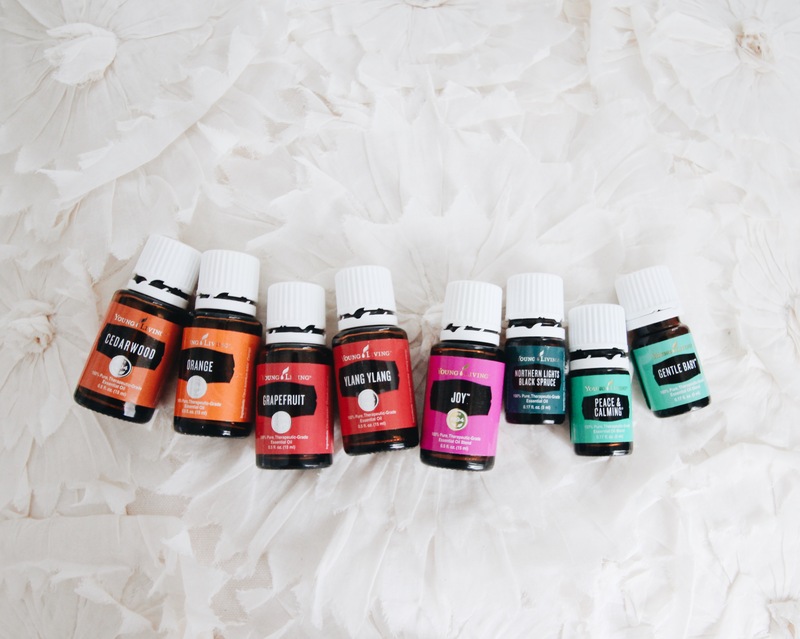 I have also never been one to fall asleep quick (compared to my husband who falls asleep in the middle of a sentence once we get in bed), until oils. There are SO many oils that can be worked into a bedtime routine to encourage a healthy nights sleep, I don’t know where we would be without them. 2. For healthy, glowing skin. I used to bounce around between moisturizers, eye creams and all sorts of serums that promised to make my skin better. I never found anything that I really loved, until essential oils came along. I now use a few drops of jojoba oil with a drop of Frankincense as my moisturizer, it supports healthy, glowing skin without the chemicals, plus as an incredibly grounding, calming oil, it is amazing to apply to skin right before going to sleep! I also love to roll lavender under my eyes, apply copiaba or tea tree to blemishes & use grapefruit with coconut oil + shea butter as a full body moisturizer. 3. For immune support. One of the first reasons we started using oils was for immune support, if you have toddlers (especially ones in daycare, preschool, etc.) you understand. It felt like week after week, we were all run down & passing it around. Adding oils to our daily routine has been life changing, every mom needs this. 4. To make our home smell amazing. I’m not sure I can ever give up candles for decor, but after reading about how toxic they are to burn, we have turned to diffusing oils instead. The best part? They have added benefits! So while Wintergreen + Orange in the diffuser smells amazing (like sweetheart candy! ), it is also uplifting & mood boosting! Blends like Lavender + Stress Away (vanilla-lime) smell heavenly, especially when diffused at bed time, they are also highly relaxing & calming. 5. For chemical free cleaning. I have always hated traditional cleaning supplies, the smells are always so overwhelming & they are a hazard to keep under your sink or around your kids. The Young Living line of cleaning products, specifically Thieves Cleaner, is 100% effective, all natural, and safe around kids. I am safe to wipe down high chairs or play tables with it, knowing my girls will eat off it immediately after. There are hundreds of ways to use oils themselves for cleaning as well, like using lemon oil to remove sticky residue (like in an instant, it’s incredible), or lemon + thieves oil with some baking soda to make an amazing soft scrub to get stains out of sinks, pans, etc. Good stuff, folks! 6. For balanced moods + emotional support. The science behind it is simple. Essential oils are extracted from plants by distillation, and have the essential aromatic & chemical properties of that plant, they are made up of tiny molecules that are very easily absorbed by our bodies. When you inhale an essential oil, receptor cells of the olfactory organ receive the aroma, and send signals to the brain which is the center of our emotions & memory. This controls our blood pressure, breathing, hormone balance, heart rate & so much more. So simply inhaling certain oils, or applying oils to your wrists or behind your ears, can be extremely calming, uplifting & grounding. One of my favorite blends we like to call Happy Mama (made up of Orange, Peace & Calming, Joy & Ylang Ylang) is one we love for any emotionally draining time, perhaps every day during witching hour or on every road trip with kids, and is amazing for things like post-partum emotions. 7. For all the best DIYs. Grapefruit lip scrub, hair detangler, muscle cream, outdoor spray, you name it, there’s an oil for that! It never fails that on any given day, I am googling things & find an oily solution. Dry cuticles? Done. Ants on the porch? Done. It is an amazing feeling to have a safe, natural (and easy!) way solve problems, you know, the way your grandma would have done it! 8. For flavor + added benefits. Young Living essential oils are all 100% therapeutic grade, and the vitality line of oils can be used to naturally flavor food & drinks! I love a drop of peppermint in my morning water, lime or grapefruit in sparkling water and basil or rosemary in olive oil when cooking! A drop of lemon oil is more potent & has more benefits since it is produced from the rind of the lemon instead of the pulp. One drop in your water each morning acts as a powerful antioxidant + stimulates metabolism, without the acidity that can upset a sensitive stomach or damage your enamel on your teeth. Incredible, right?! I hope this is helpful for anyone who isn’t sure how to use their oils or for those of you considering getting started! As always, you can find more information on how to get started using oils for your family here, or you can follow along on my Grapefruit & Gold page for lots of oily goodness! I am already a distributor for Young Living, and love love everything! You are such an inspiration for me, not just with oils, but in life! Thank you so much for sharing! Where do you get your diffusers? Seriously such a good explanation of why essential oils are amazing!!!!!!! Oils are the BEST!!!!! So happy we started using them, they truly changed our lives! Thank you for these tips! I just got my starter kit and can’t wait to dive in! Can you order samples or individual bottles? Or do you have to order the whole set of 11 to start? Momma to 2 boys, ages 3 years and 6 months. One has had preschool crud on and off since August (!!!) and the other considers sleep his mortal enemy. I’ve read a lot about oils and think I’m ready to take the plunge! I think you must have read my mind when writing this post because I was just thinking about ordering a couple of things last night. I’m now sold and need every single one of the vitality oils! What do you recommend for stress relief? Thank you so much for this blog post…so informative. How do you recommend using the oils for immune support (my primary objective with three little ones who are always sick)? Do you just put a diffuser in each child’s bedroom at night? Great information! Do you mind sharing what brand of jojoba oil you use? Wondering how and what oils you use for immune support for toddlers? We love the idea of essential oils and have diffusers in both the kids rooms but we are admittedly still confused about *exactly* what to put in them aside from the standard lavender/cedarwood/yang ylang sleep promoting stuff. We also have an atomizer and I am so confused about it….am I literally supposed to just plop the undiluted oil jar in it and let it blast away? I will try to follow your G&G Instagram to see what kind of stuff you are posting there; maybe I will learn a few things! Hi, I just purchased the starter kit through you yesterday and the link I got emailed to me for the Facebook group doesn’t work. It said the Link is broken or I do not have access to the page. It let me ad the other group you sent, but not the Grapefruit & Gold one. I’m very excited to try the oils! Is only the vitality line safe to ingest? Thanks! Also wondering what diffusers you use for babies and in their room? My ten month old and toddler share a room and something calming and sleep-encouraging might change our lives lol! Thank you so much for this!! I am very interested in getting started with essential oils. Where do I even start? I also really want a diffuser!